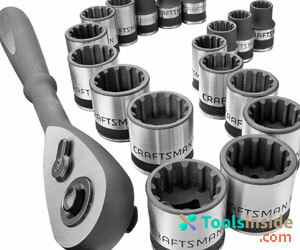 If you don’t know how to use socket wrench set then this article is for you. A kind of wrench that is used to turn a fastener designed to have a socket at one end is called a socket wrench. With many people calling it simply as “ratchet wrench”. This device is basically a hand tool with a ratcheting system on which a metal handle is attached. This special wrench works perfectly whenever the wrench is pushed or pulled while fitted to a bolt or nut by tightening or loosening the same. What is the Difference Between a Wrench and a Ratchet? While a ratchet is a type of wrench that has a special mechanism attached to the sockets via its square driver, all types of fasteners have their unique sockets in metric and SAE dimensions. 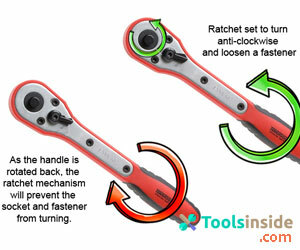 The most significant value of a ratchet is its simple mechanism cause it stays in the same position even when pulling in one direction while releasing in the opposite direction. 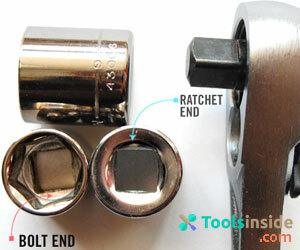 This makes it super easy to tighten and lose fasteners or nuts without having to put and remove ratchets continually. It is important to ensure that you are getting the best socket wrench set to ensure you are ready to go when it comes to turning a fastener. Below is a beginner’s guide on how to use a socket wrench set. By reading this I am sure that it will help you understand on how to use this tool. With some having up to hundreds of sockets, it is important to pick the right on to avoid damage. You should remember to check what exactly is the type of socket the fastener needs and use that. It’s quite simple to do this as most socket will have size indications on them. In case you are in a situation in which you are still not sure, then choose the closest match. Check again before putting the-the socket if it’s the right size. If you find it’s too small or too big, you should try to check other sizes to avoid possible damage. You can move up or down by size until you are sure you’ve picked the right one. Not only that but you can also confirm sockets sizes using imperial and/or metric sizes. Another important point to note that choosing a socket is that the drive socket of your socket should match the ratchet drive square dimension. You can attach the socket and ratchet after you have chosen the right one while making sure the drive socket of your socket matches the ratchet drive square dimension. You can also use an adaptor module is you want to use a drive square socket in case the ratchet drive is of a different dimension. You will soon realize that socket drives possess a side hole, groove or notch. in case yours has a side hole, you should line the socket drive with the drive square ball bearing. To ensure that everything is great and you are good to go, you should inspect the tuning of the device. This can be done by holding the socket with the left hand while the right hand move the ratchet right and left continually. While doing this, if you realize that the ratchet isn’t moving as It is supposed to, you should then change it prior. You can also use the lever on the back of the ratchet ton tighten or loosen the fastener. This is a very important stage that requires high precision. Then the fastener or head is positioned in such a way it is lined with the head. 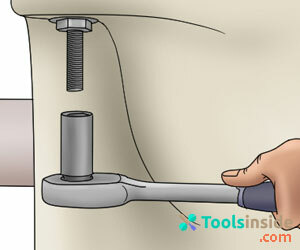 As explained earlier, you can now use this to tighten or loosen the ratchet. Note that turning clockwise will tighten the fastener while turning anticlockwise would loosen the fastener. Keep rotating the handle in the direction you want the fastener or nut to be turned. Be sure to rotate the handle from the opposing position if there is no more handle swinging space. Depending on how comfortable you feel your grip is, you can re-position the handle and start from the starting point and more turns. Resistance is necessary for the ratchet to work, hence It might be necessary gripping the socket to avoid it turning in the wrong direction. Until the fastener is completely loosened or tightened, keep turning as discussed in previous sections. You can always use the quick release button to release or take the socket off. The quickest release ratchets are made with a special spring which enables it to detach easily, in case yours does have the quick release button then you might have to remove it manually. It would probably require you to use muscle or two as ratchets are usually fought. 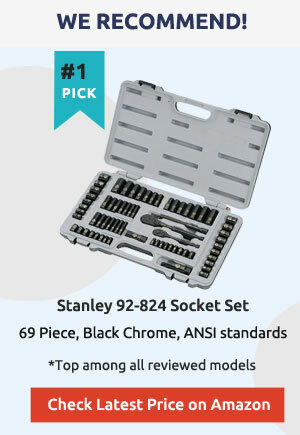 Be sure to invest in a high-quality socket set. This is because you can find it’s sockets and drivers easily. Avoid using a socket whose size is much more than the fastener to avoid damage or stripping. Never use a socket that’s too large for the fastener. Doing so might lead to slips, stripping or damage. Along with extra reach, extension helps to make the work more comfortable. It is important to get a great extension. You can use the ratchet in hard to reach areas such as when dealing with engine parts. You should also be careful not to damage the sockets by using normal sockets with impact tools. Once you’ve gone through this how to use socket wrench set guide and mastered using your tool, then you can be confident whenever you have to fix something around the house that require this socket wrench. Be sure to purchase socket wrench or spanner only from a certified wrench set dealer. This will help you avoid ending up with a low quality tool that won’t really last long for you.